Enjoy digital movies (DivX, Mpeg-1, Mpeg-2), music (MP3, WMA, OGG), and photos (JPEG) on your TV. MPEG-4(DivX 3.11, 4.x, 5.x, Xvid), MPEG-1, MPEG-2, MP3, OGG, WMA, JPEG. USB External HDD. Uses a 3.5" HDD (not included). Supports FAT32/NTFS (multi-partition). Multilingual subtitle. Video : Composite/S-Video/Component. Audio : Stereo/Optical/Coaxial. USB 2.0. AC90~250V. This box does for movies what the I-Pod did for music.I thought it couldn't be true - but it works quite well. This box costs less than an I-POD, holds (if you install a commonplace 300GB hard drive) 10 times more data, and (gasp!) delivers AC-3 5.1 audio and HDTV 1080i output as well as MP3 over the optical digital cable or digital coax. I have hooked it up to my HDTV and 5.1 system - you cannot tell the file is DIVX.Even if you don't rip your DVD's into DIVX, it is a huge convenience.The documentation says it will accept subdirectories that include the original DVD Video_TS files -- keeping the current menus and options of your DVD's.I haven't tried that yet. My only caveat - documentation is poor.The "empty box" needs a 3.5 inch hard drive - a big one.Also, if you buy the empty box, you need to format a hard drive in your computer first, then install it into the TVIX box. Why do you need this?If you have a vacation house or boat, or take long drives, this VERY small box (after you put in a big hard drive) holds 300 dvd's in Divx format, holds 1000's of songs as MP3's and all the photos you can create and displayes them all in a menu-operated format with a remote control.You don't need to lug around your whole video and music collection.I think it is great for kids going to college who don't have space in the dorm and won't take the entire family movie collection. I haven't touched my DVD player in months - it is faster to turn on the TVIX and browse through my movie collection by remote control. I only wished they made a version that would hold 2 hard drives. I bought this primarily so that I could watch DivX on the TV in bed. So far, I've had a great experience with this. It plays most of the mainstream codecs such as Xvid, mpg, DivX. The interface is great and it's very very easy to use. Shove a HD in and you're good to go. I gave this product 4 stars as oppose to 5 because some files don't play correctly and codecs such as Real, OGM or WMV are not supported. (Though this situation can easily be remedied by converting the video and who knows perhaps in the future they'll release a firmware upgrade to support more.) Overall, this was a great purchase. I would buy another one if I needed another one without much thought. TViX - What a great idea! This box is fantastic.I can play the ripped VOBS from a DVD.All you need to do is create a playlist to list the vob files in order.Divx support is very good as well.I formatted this drive (which is not included) with NTFS, and it worked without a hitch.Updating the firmware was a snap as well. I have nothing but accolades for this little box. Pros: Small size and very portable, barely larger than two 3.5" HDDs stacked together. It supports a wide range of file formats, has lots of A/V connection options, and the jukebox UI is very easy to use. Cons: The manual does not cover a lot of setup details. The tiny cooling fan is a bit noisy. Video and sound file support is great, but a few more photo file formats would be nice. It only supports jpeg. I ordered this device along with a separate 250GB HDD, which I installed myself. When I tried to set it up, I discovered that several critical details were not covered in the manual. For example, after I installed the HDD, I plugged it into my TV and powered it ON, expecting to see the setup menu. Nope, it won't get past the splash screen until the HDD is formatted. OK, so I figured that out, no problem. I then discovered that it can either act as an external USB storage device, or it can act as a multimedia jukebox, but it can't do both at the same time. Whenever I plug the USB cable into my PC, the video output is disabled. OK, I can live with that, but it wasn't mentioned anywhere in the manual, and I thought it might have been defective until I realized what was happening. Finally, the manual was a little skimpy on the steps to update the device's firmware, which you can download from the dvico website. The manual wasn't clear that you had to unzip the files into the device's root directory, rather it implied that they had to be in a subfolder. I figured that out with a little trial and error. The setup menu is pretty simple, and it has a lot of video options, including 480p, 720p and 1080i, as well as selectable screen size options such as 4:3 and 16:9. Selecting the best combination took some trial and error, but I found one that looked right to me after a while. You can create whatever folder structure you want on the HDD. The jukebox's UI lets you navigate the folders, select files to play, and create playlists. It displays file properties such as size, length, etc. I loaded a few DivX files, and it plays them without any problems. I didn't try any other video formats. I saw no stutters or artifacts. I tried playing a few WMA files, and they played fine through my TV speakers. I haven't hooked it up to the HT receiver yet, but I don't expect to have any problems when I do. There is a file management application available on the Dvico website. I downloaded it and installed it on my PC, but I have not yet spent much time with it to see how useful it is. 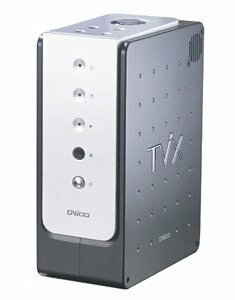 The Dvico website mentions a carrying case, which would come in handy if you plan on taking your TViX with you when you travel. I have no idea where they are sold. Portability is one of the best features of this unit. This is a potentially great product that's on the market despite being shamelessly flawed. I bought an ipod, but found that customer support was expensive and useless; I use it for jogging and basically the battery gets me through only one workout before it needs recharging; iTunes, which is the only way to get songs onto the iPod, is terribly limited. Most of all though, it's the battery that makes me resent Apple most. They're making a fortune selling something that (surely they know) is terribly flawed. It also makes you feel disgusted with the mass media, which is pushing this product because it's "cool," without paying to attention to whether it actually works. Died after 1 year and 8 months. I used to love my ipod,but the fact that it recently died on me after a year and 8 months of use has left me with a very bad taste in my mouth. The most painful aspect is that I did not abuse it or use it heavily. The apple store guy at the genius bar informed me that a replacement would cost $250. Better than paying full price, but I am utterly disenchanted and will not pay for another ipod given my experience. Sorry Apple, you got to do better on the reliabilty issue before I even consider another ipod. when I'm on the road. It is definatly so much better than CDs. I've downloaded more than 150 songs on Itunes on my computer. What a great device. It stores everything I could want and then some. Its battery life is a little disappointing after several months, which is why I'm giving it four stars. The navigation is smooth and very effective. Long plane flights and car trips seem far shorter with this gadget in my hand. The Ipod is kinda pricey, but worth every penny.Great size.Sharp looking.Well designed and made.Opted for the 20G as I have a fairly large music collection.Hardly used any space even after having loaded a few hundred songs. I use a pair of well regarded, inexpensive Panasonic headphones thus sound quality is excellent.Ability to load and organize music is simply wonderful and quite fast via USB connection.The touch wheel is the best feature.While waiting for a case to arrive, I've covered the back with 3M paint tape to avoid scratches.Watch out if you're going to use a USB 2.0 interface.One card and driver kept causing the PC to crash when attempting to load music.Belkin USB card and driver work great.No crashes or problems.I agree battery life not great, but acceptable.One complaint I do have is the price gouching for Ipod accessories like auto charger cord, dock, cables, etc.I'm in heaven.No longer bored at work nor forced to talk to others.I can simply enjoy my tunes now as I work. 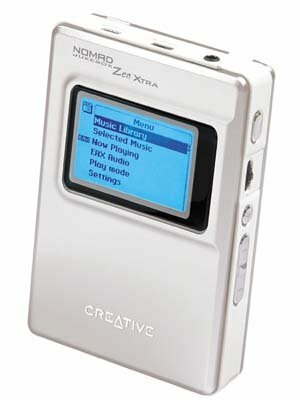 This is the version of the Creative Nomad Zen Xtra with a faulty headphone jack. You want item model number 70PD055000032, not 70PD055000017. The other one is the same product, just manufactured at a later point and they have fixed the headphone jack problem. Hope this helps. I bought this wondering if it would work as well as some said or turn into the nightmare that some (the few) said.It is Great and works like a dream.One thing:Read on how to use the product...that took a bit of getting out of "I'll figure it out" but the scroll wheel was something that once I read it was easy.I have 2000 songs in another format (real player) and the stubborness in me made me want it to work.Real player had the problem but all turned out well.I don't have a problem with the cover coming off.I don't have a problem with dropping it (duh, I don't treat it like a basketball)I have room to spare for more songs and playlists and others others asking me how to buy at this price because Ipod is so expensive that it's pricing itself out of a market that is not only easy to use with multiple formats but for those who do not want to take the time to convert or re-load all their music.I give it 5 stars knowing that I had a great experience and "didn't have to ask customer service for help... didn't drop it and am semi-computer literate (and realistic to know that asking directions sometimes = reading the directions)"I have a friend that asked me if he should buy...?I said YES! After a little over a year my Zen Xtra has stopped playing sound. Everything else works it just appears to be a faulty headphone jack which is a common problem on Creative's players. On a dinky $30 portable I wouldn't expect much but on a $300 device this is just unacceptable. Their warranty period and customer service is a joke. Go have a look at their forums. Stay away from Creative products. There are other alternatives out there. I love my Zen Xtra 40GB - well at least I loved my Xtra.The player is great, except for one major detail - the shoddy quality of the headphone jack.IT WILL FAIL! If you get lucky it will still be under warranty.If you aren't expect to pay at least $40 for the clowns at Creative to fix it.If you think I am just flaming them, check out their forums. I got this for Christmas in 2003, and have used it regularly ever since (every day to/from work, plus during travel, in the car, etc. ).I've still got tons of storage, and it's no worse the wear even after a couple of drops.I find the software very easy to use, so no complaints there either.It's not as cute as the iPod, but frankly, I didn't find the trade off of price vs. size worth it -- the Creative is still plenty light enough to loop on your belt while you're walking. Sony High resolution color PDA included in bundle deal preprogrammed and ready to use. Removable hard disk, upgradable, USB 2.0 (480 Mbps) transfers, Win, MAC, or Linux, no special software required. Built in FM transmitter covers entire home or car, line outputs, fiber optic out, car or wall power input, easy to install. Options include Bluetooth controller, steering wheel remote, gooseneck mount and various other mounting options. Dynamic playlist support, super easy control of your entire muzic library. Specify color (red or gray) and PDA cable type when ordering or email us. I was very disappointed in this unit. I was very disappointed in this unit. I was going to take it on two-week trip, where the eight of us could save all of our pictures, and review them in the hotel during the trip, and burn a DVD for all at the end, but after discovering the following deficiencies, I threw it in a drawer instead: (1) power brick and cables were almost as large and as heavy as the unit itself, (2) the unit took 5-7 seconds just to display the next picture - making quick review very frustrating, and (3) the video cable for displaying on a TV did not work, or just barely worked if one jiggled it and held it out 1/16th of an inch and applied pressure - either a defective or poorly designed cable/plug.I'd expect this from a $5 pair of cheap headphones, but this unit cost me almost 600 dollars. I had the need for a product that could be used for: 1. playing MP3, 2. dumping photos 3.Viewing photos and 4. Portable data storage. 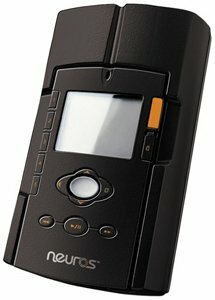 Along with the Archos products this was the only device which can do it all. I selected this because I prefer the "gameboy" design since it protects the screen well. In fact, I was so impressed with the specs that I was prepared to pay about $170 shipping(to south africa) and run the risk of losing it since there is no support outside US/Europe at all. It all paid off(so far). Fortunately it arrived intact and I have had the device now for 3 problem free months. It plays music with exceptional quality and photo dumping from all card formats are a breeze with the very flexible optional adapter. TV connection also works well. The video only supports Motion JPEG - MJPEG.AVI files. I have been able to look at .avi videos taken with a Canon camera successfully. However with a downloadeable translation tool from their web site, many other formats can be translated and it works. The translated video takes up a bit more space after translation. Since the device firmware can be upgraded, one hopes that they will come out with more video codecs. The only glitch i found is that the operating system can be very slow when you have large directories. With 80GB of dispace available, a directory can become too large very quickly. That requires a lot of organizing if you have lots of music to store. I also requested from the support people to confirm (before I ordered)whether I would be able to read a Memorystick Duo (with supplied adapter) but there was no satisfactory answer. Battery life is not great, about 3 hours when playing music only, but that should be expected for a device such as this. When only using it for dumping photos, it lasts for days. An all in all impressive product which have given me countless hours of joy(so far) and I would recommend it for sure. In fact, I have not seen a device on the market yet for the price that can beat it. -Easy User Interface. Plug and save for your compact flash card without having to turn the unit on if you are in a hurry. -Nicely designed exterior and 3.5 inch display. -The screen resolution in review mode wont allow you to determine sharpness absolutely but definitely will allow you to review pictures and show them to friends. -There are smaller units out there but this is a nice compromise for size and functionality. -This unit is a hard drive,so don't expect to take this running when you listen to you MP3 player. -It has good sound quality when using headphones. Its one of the best mp3 players out there, if you can stand its ugliness. It works perfectly first time every time. I have never had 1 problem, and I have 3 of these things. And its so packed with features. You'd be hard pressed to find a more open source, modular, drag-and-drop, simple player anywhere. The product worked well when it was first received, but after using the MyFI feature the unit refused to turn on.I sent the unit back to the manufacturer, but when I got it back it was still broken and will have to try again.The forums on the neuros site seem to indicate that this is a fairly common problem.This device has many feautures, but is clearly lacking in quality. Great features on paper...But when you try to use it, you get an error message - Check out the review on the 80 GB unit.Looks like someone else had the same issue.Straight out of the box the unit will not power up properly. I had this device for a little bit over a year, and I like most people didn't opt for the extended warranty.In short, it died as soon as the warranty expired.It's the way hardware is and I'm fine with that, but Apple's support wanted to charge me $250 to have it repaired/replaced.That is almost the same amount as a new one, and certainly more than most of their competitors.When it worked, it was great; a device I truly enjoyed, but once it starts having issues, you better look for another device; Apple wont be of much help you. While the iPod is great for the amount of music you can store on it, Apple has done a poor job with creating a product that lasts.The battery life is minimal (less than 4 hours and I've had it for less than a year), and it costs you $99 to send your product to Apple to have a new battery installed!I'm told you can change the battery for cheaper yourself, but it nullifies the warranty (and on such an expensive electronic, that is not too prudent).The program Apple supplies to be able to add music to your iPod (iTunes) is also full of poorly-chosen options.It comes with an auto-sync option, which at first sounds appealing, but later proves to be more trouble than it's worth.Having attempted to clear my library in the program, iTunes proceeded to delete all my music & recordings from my computer (many of which I cannot replace).If I were to try to sync my iPod to my computer at this point, the auto-sync feature would replace all my playlists with empty ones.After calling Apple, I found out that there is a 10-15 SECOND window in which I MAY be able to turn-off the auto-sync prior to losing all my iPod files.If, however, I am too slow, or my computer doesn't respond fast enough, I lose everything on the iPod as well. After all that hassle, the good points of the iPod are it's portability (small size) and it's capacity to hold a lot of music/recordings.I hear there are also some calendar and address book features avaliable to Mac users, but not to PC users. 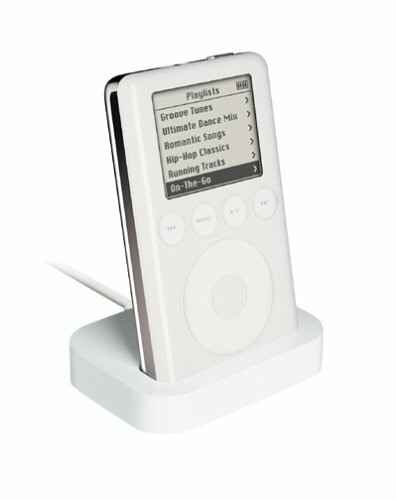 Have had my 30 GB iPod since November 2003, and am still loving it.Very few complaints - the sound quality is excellent, the user interface is easy to use, and the syncing with iTunes works flawlessly. Probably the best feature of the iPod is the easy to use/navigate user interface - it's a snap to find the song you want quickly or build a playlist on the fly.It's also nice how the statistics from your iPod use such as number of times each song is played, date last played, and ratings (0 to 5 stars) carry over to iTunes and vice versa.The smart playlists from iTunes also work, so, for example, I have a playlist on my iPod of all songs rated between 3 and 5 stars which haven't been played in the last month.Pretty nifty. You cannot import playlists, you have to create them using clunky software included with the player or on the player itself. This becomes much more difficult with large numbers of mp3's.You also must select and load mp3's with the software one by one.The unit's database crashes frequently and must be rebuilt using the software, this destroys all playlists. The only media player that supports it is "Musicmatch Jukebox" and only the version included with the player, (It's not much better as an interface than the other software included with the player). This is a discontinued unit which is being sold off by third party resellers under several different names, there is almost no tech support available except from other owners. If you are really considering buying this product, go to the manufacturers webpage and read the forums - http://www.neurosaudio.com/community/forum/default.aspYou will see that a VERY LARGE percentage of the people who purchased this product had the same problem.When i bought mine it worked fine for the first few weeks (just long enough for me to get about 60-65 gigs of music onto it from different sources) and then the battery quit on me.That is to say, it turns on for a few seconds, wont let me do anything, then turns off.It also will not charge or function when plugged into the AC adaptor.HOWEVER, i managed to get it to run off of USB power long enough to get my music off it again.I have heard that their customer service is awesome, however, i am in Iraq right now and havent had a chance to talk with them.It is really depressing too because this is obviously the most innovative and feature-packed player out there.Plus the 80GB size is hard to beat.Also, if you are considering jogging/running with this thing, good luck, its pretty huge. Great features on paper...But when you try to use it, you get an error message - I actually got the 40 GB unit.Looks like someone else had the same issue.Straight out of the box the unit will not power up properly. Customer service has been very responsive, but I am on my second replacement unit. I am having no luck with getting an actual working player ( even the guy I talked to in customer service said they were having many problems with this issue and my replacement unit would take a while to come out since they were waiting for a good batch from the factory). I live in a large city also so the FM transmit thing will probably not work well since most station frequencies are taken. Save your money .I am just glad I didn't shell out the $$ for the 80 gb unit. Did you call Neuros Support? I'm sorry to hear you had issues with your Neuros.This is not at all typical of a normal Neuros experience.It is normal that the buttons don't work when the USB is plugged in as it is for accessing/copying data from your PC. If you still have your Neuros and want to give us a call, we can probably walk you through your issues and figure out if there are any hardware problems. 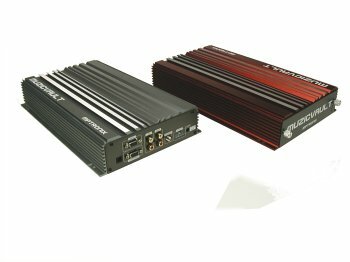 Built in FM transmitter, line outputs, fiber optic out, car or wall power input, easy to install. Options include steering wheel remote, Bluetooth controller, gooseneck mount and various other mounting options. PDA controlled, supports Palm, Sony, Garmin, Treo, and Tapwave. Wired or Bluetooth control, charges PDA, PDA Required. Options include steering wheel remote, wireless Bluetooth adapter, gooseneck mount and various other mounting options. I bought the 40 Gb Audio pc for ethnographic fieldwork. It can't be beat for its abilty to record directly to mp3 format (among others), which makes downloading and archiving interviews incredibly easy. 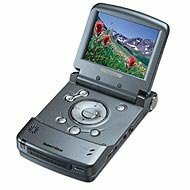 It's also great for storing computer files, but it's a little too bulky as a personal mp3 player (I have an iPod Mini for that). It is, however, great for listening to your music files in the car, as it has a built in FM transceiver that automatically looks for an inactive frequency. You can also record directly off the transciever, which is kind of silly for songs but great for radio interviews that you may want to use as data. There is one drawback to recording--the built-in microphone is sensitive, but it also picks up the sound of the hardrive, giving you this quiet hum in the background (not horrible in mp3 format, but much worse in WAV format). And if you use a digital line-in microphone, it needs to be both self-powered and have a pre-amp to be heard, which can be a little pricey($100 and up for each). Otherwise, given the reasons behind my purchase, I am very pleased. I've even used the line-in directly from my DVD player to record my favorite soundbites from Family Guy. Customer service has been very responsive, but I am on my second replacement unit. I am having no luck with getting an actual working player ( even the guy I talked to in customer service said they were having many problems with this issue and my replacement unit would take a while to come out since they were waiting for a good batch from the factory). I live in a large city also so the FM transmit thing will probably not work well since most station frequencies are taken - Again refer to the review on the 80 GB model. Save your money .I am just glad I didn't shell out what the poor guy who bought the 80 gb unit did. A. It syncs with linux - and this is no 'hack the kernel to get it to work' thing either.Set up Java on your computer and download NDBM, mount your Neuros and it works. B. It plays ogg vorbis. (http://www.xiph.org/ogg/vorbis/) For those of you that haven't heard yet, this is a codec similar to mp3 but completely open and free.Also in many listening tests, people say it sounds better.Hear for yourself at (http://www.xiph.org/ogg/vorbis/listen.html)My entire music collection is in ogg vorbis. On top of those two things, it can record to mp3 or wav.It has a built in FM transmitter.It has a built in FM tuner.For any other music player, those would all be accessories with an additional cost.Not only is it a wonderful player, it's a great deal. I've used my 20G Neuros with linux since day one.First with the Positron tool released by DI, then with NDBM written by an enthusiast (thx Starkey). The neuros meets my expectations as a music player and portable hard drive.With windows your neuros is simply seen as a mass storage device. I am currently working through some issues with FM reception, but I have confidence that either DI or the forum community will help with that. If you're reading this are probably interested in getting the Neuros MP3 player and multiformat recorder.I'll give you a few basics that may help you decide. I bought this because I want a recorder that record FM channel and this unit could.But also that it could broadcast on an FM channel was an added bonus, and didn't require an additional part.Another feature that won me over was the line in recording.So I could record from an audio source using an eighth inch audio cable. And here's a few things about this unit.It doesn't have a microphone preamp so you can't just run a microphone into it.You'll need to buy a preamp that is kind of a bummer.And the lowest MP3 you can record at is 64 K.
This is the bonus feature section!!! One of the biggest reasons to get this player is that has open-source firmware (this means that the community of Neuros users can adjust the firmware that are released an ad features).This is already available through the garbage-branch firmware this firmware adds so much to the recorder is a must-have.Go to the Neuros web site and check out the user forum.There's tons of information.Also, this unit has the bonus feature of being able to record in wav (which is uncompressed audio).So you won't get any distortion by compression, and also it's able to record in ogg vorbis which again I believe is an open-source audio compression format that is lossless. So, this unit has a lot going for it.I was able to record seven plus hours of FM radio.On one charge of the battery that was after I upgraded to the open-source firmware. One quick note there many versions of the Neuros available.There is a 128 MB/256 MB Mini player, with those you can buy a backpack.That is actually just a laptop hard drive in a case, thus allowing you to add 20 to 100 gigs of hard drive space.No thing to note is that you cannot pop out the mini Neuros from the ones that do not have the flash memory inside.I hope that made sense, if not go to the Neuros web site. Dynamic playlist support, super easy control of your entire muzic library. Specify color (red or gray) when ordering or email us.